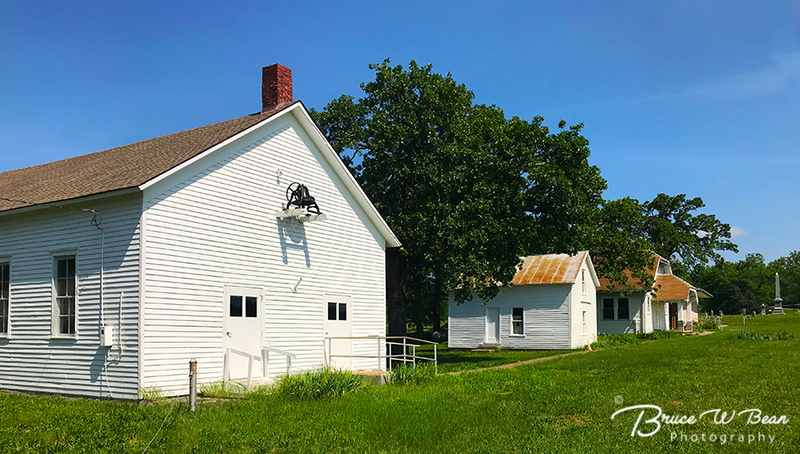 Take a Day Trip south from Kansas City to sample the Kansas countryside, prairie land and explore the area’s Civil War History. The journey focuses on activities and sites in three locations as seen in the map below which shows the entire route. The first day trip stop is 60 miles south of Kansas City near the Kansas / Missouri Border. 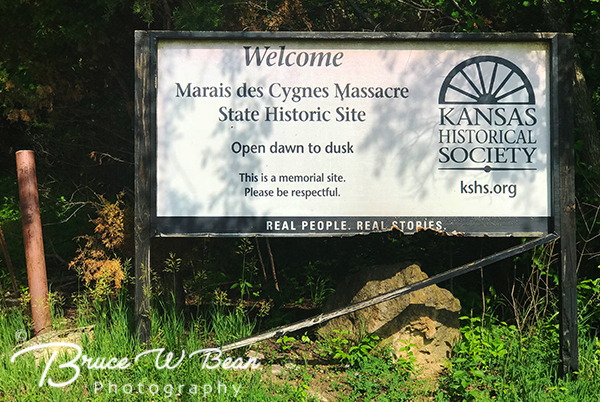 The stop gives visitors the opportunity to visit two historic locations – the small village of Trading Post Kansas and nearby, the site of the Marais des Cygnes Massacre. 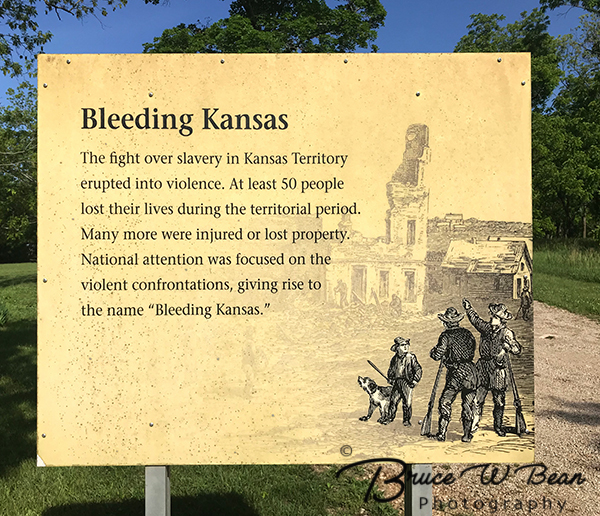 Trading Post Village was a focus of a significant “Bleeding Kansas” event when in 1854 Charles Hamilton,who reported was driven out of the area and was described by some as a “Missouri Ruffian,” led 30 men into the Village area where they captured 11 free state men. They then led the captives a brief way northeast through the woods and into a ravine where they were shot. 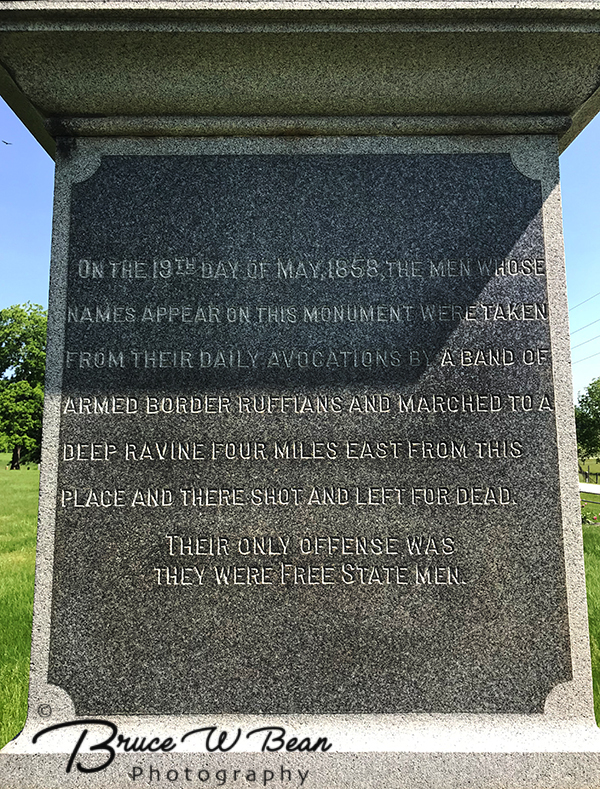 Five free staters were killed and five were wounded. 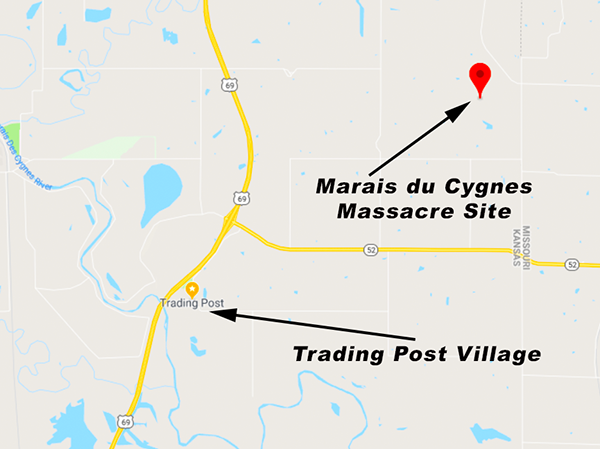 The event came to be known as the Marais des Cygnes Massacre, named for the nearby Marais des Cygnes River. 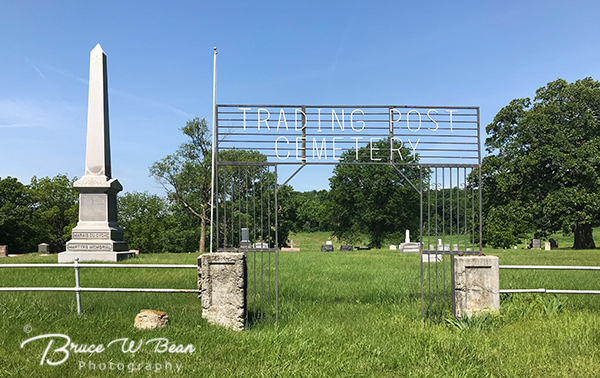 Today Trading Post Kansas remains a tiny residential area. 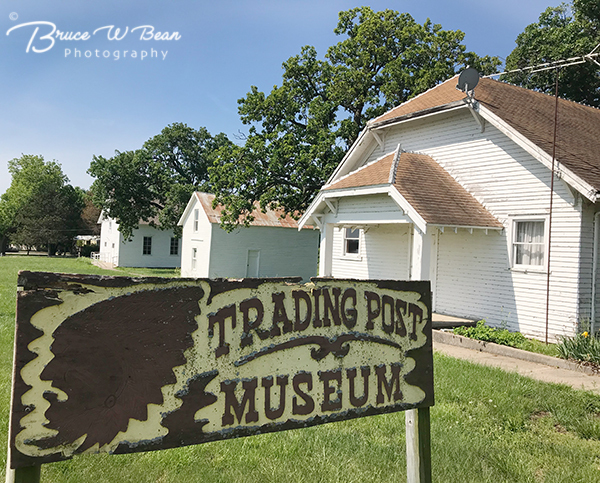 Nearby there is a series of old white buildings, one of which is the Trading Post Museum. The museum houses a variety of artifacts from the regions history. Be aware. The museum has very limited hours. The website says they are open Wednesday through Saturday from 10AM to 2PM. I visited on a Wednesday, arriving at 10:35 AM, and photographed the area for around a half hour. During that time I didn’t see anyone, only encountering the sign on the door shown below. 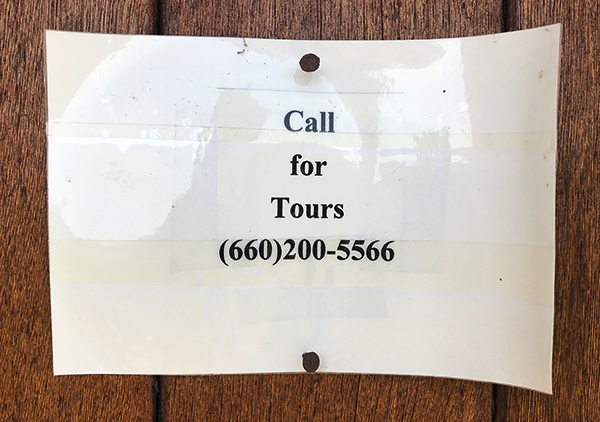 My advice, especially if your time is limited as mine was, – call ahead to confirm the museum is open. 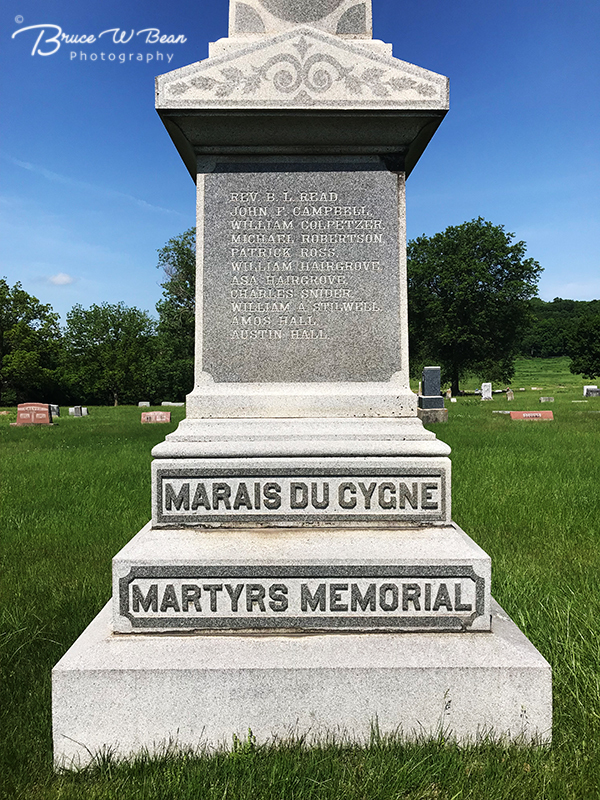 The Marais des Cygnes Massacre took place on May 19, 1858 when a group of armed pro-slavery Missourians captured 11 anti-slavery Kansas in Trading Post, Kansas. Marching them to a nearby ravine, the captives were shot with 5 eventually dying of their wounds. The event gained not only local attention but also national awareness as it was reported in The New York Times and other eastern newspapers. 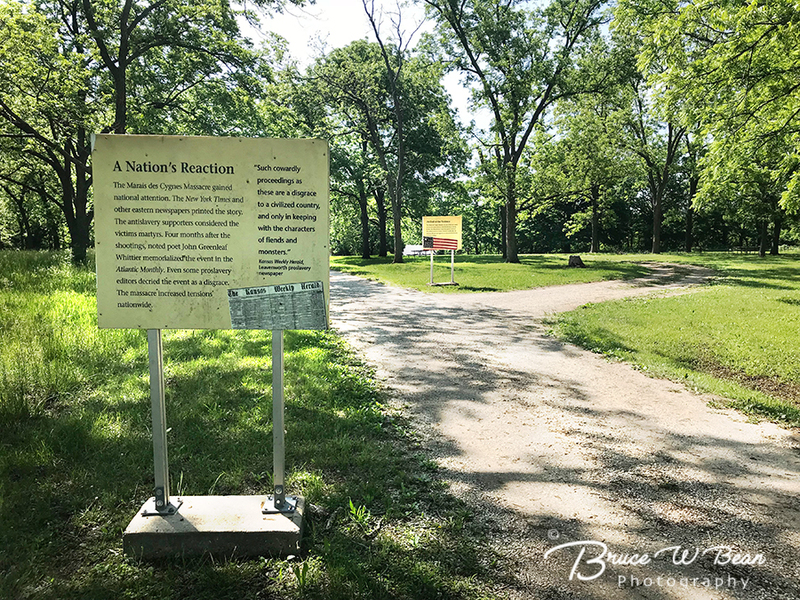 Today the historic site includes a small cluster of paths and roadways which not only give access to the site but also are lined with signs giving brief insights into the history of the area and the period. 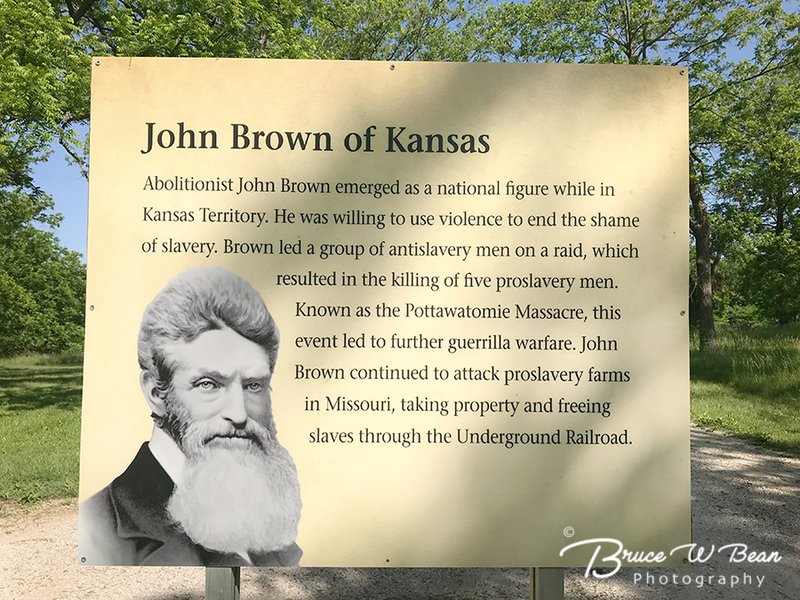 John Brown, an abolitionist and free stater and advocate of aggressive military action was living in Kansas at the time and came to the Kansas / Missouri Border and massacre area around the end of June of 1858. 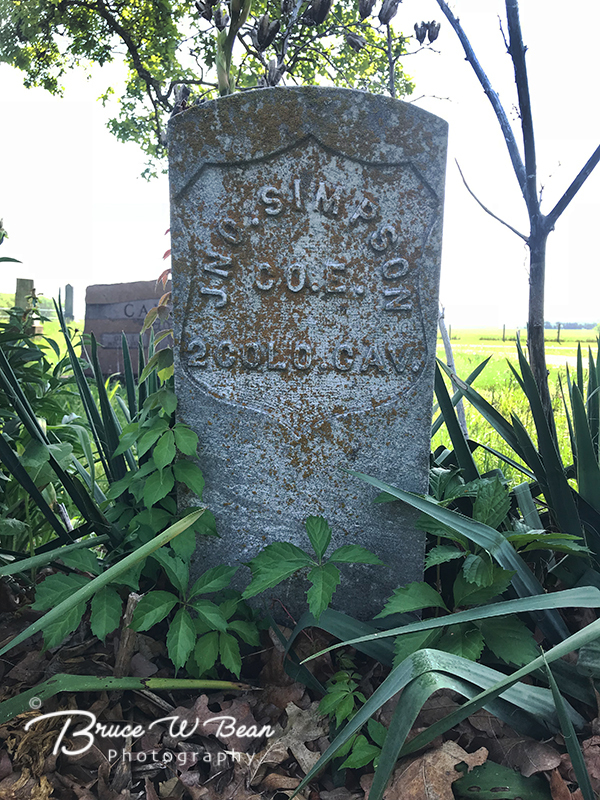 On arriving he helped construct a two story, log walled “fort” several hundred yards from the massacre site. 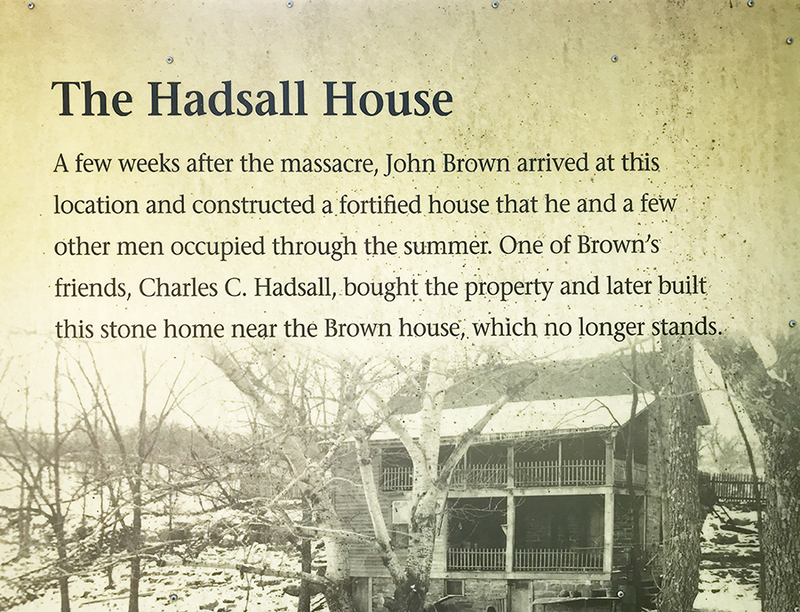 Brown and his men withdrew from the area by the end of summer, leaving the fort to John Brown’s friend and the owner of the land, Charles C. Hadsall. 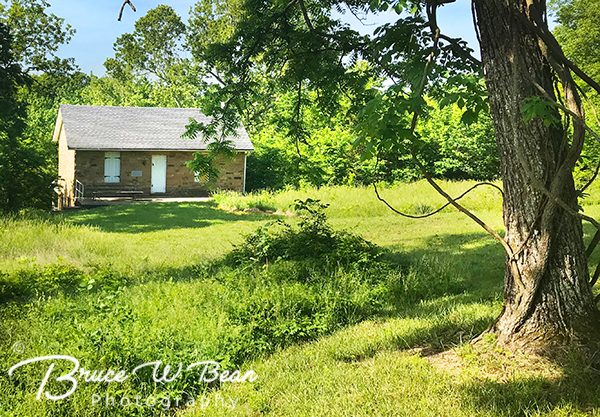 Although the “fort” built by John Brown no longer stands, the Hadsall House remains as the only building on the historic site. 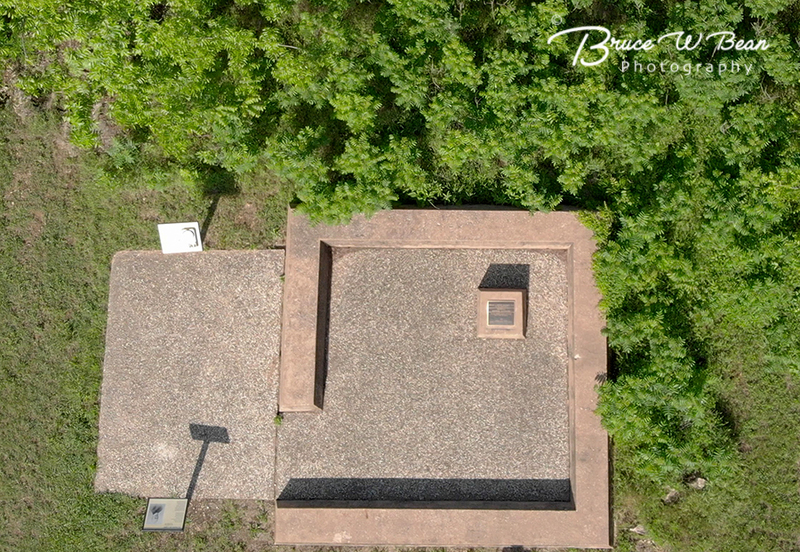 Today the location is maintained as a Kansas State Historical Site. 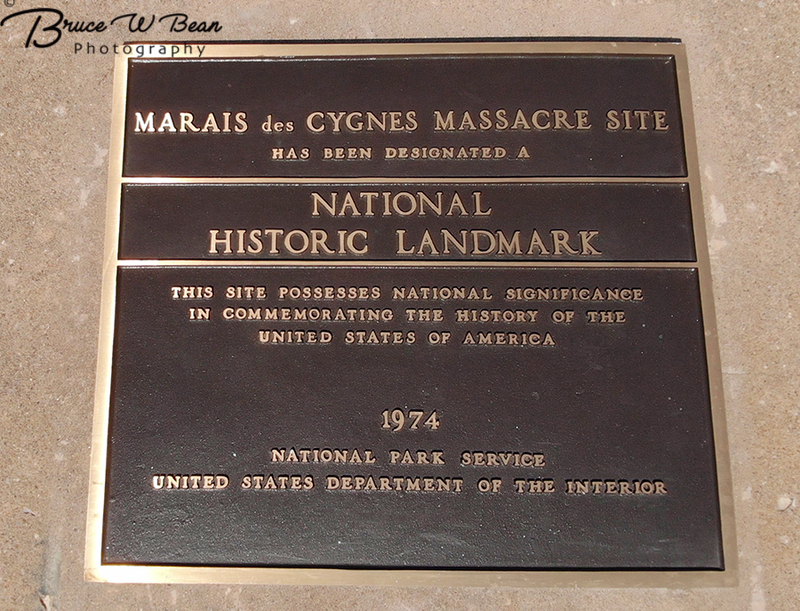 In 1974 it was designated a National Historic Landmark. The site well back from the main road but easily reached by following roadside signs. It’s a lovely and quiet area with a few picnic tables. I was the only person exploring the area during my visit on a Wednesday morning. There is no charge for entrance and there are no services or facilities on site. 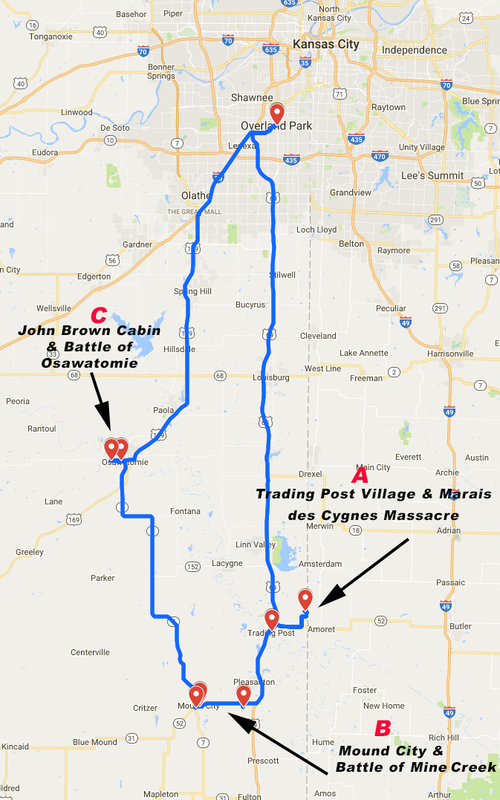 A follow-up article with share information about areas of interest at the second stop on the Day Trip South From Kansas City including Mound City, Kansas and The Battle of Mine Creek. Be sure to check back. Take A Day Trip From Kansas City ………. And Enjoy The Adventure!